On April 25, 1775, hundreds of New Yorkers acknowledged receiving “a Good firelock, Bayonet, Cartouch Box, and Belt.” Six days after the Battles of Lexington and Concord, and three days after Israel (Isaac) Bissell told New Yorkers the news, Alexander McDougall mobilized support against the British. The War of American Independence had reached New York and, with hundreds of supporters, McDougall was ready to fight. By April 1775, McDougall was a revered figure across colonial America, widely known as “the Wilkes of New York.” He was an individual who, like John Wilkes, was perceived as willing to fight for the liberties of the press, the people’s welfare, and against arbitrary rule. McDougall’s popularity, by 1775, had been five years in the making. But, in 2015, historians are yet to fully appreciate the role he played in the coming of the Revolution. In this post, I want to reemphasize his influence in affecting New Yorkers’ allegiances. In early 1770, McDougall was in prison under charges of authoring what the New York General Assembly and acting governor deemed a seditious libel. His supporters showed their support by coordinating extravagant political spectacles that appropriated him with Wilkes. Many touched upon the Wilkite symbolism of the “forty-five.” For instance, on March 15, 1770, it was reported that forty-five virgins sung a slightly amended second half of the Forty-Fifth Psalm “to the Illustrious Prisoner.” In the song, the women characterized McDougall as a martyr for liberty. Other colonies recognized what was happening in New York. They, too, supported McDougall’s plight. The dispute between “the Friends to Liberty and Trade” and Alexander McDougall and his supporters began in earnest in December 1769. McDougall had been attending the DeLancey-led Assembly since November, watching on as the assemblymen performed the politics of the day. But on December 15, 1769, nobody was allowed in. John Cruger, the Assembly’s speaker and a firm partisan of the DeLanceys, was absent. The debates took place in secret and, after some disagreements, the assemblymen appropriated £2,000 for British troops within the city. When McDougall learnt of the Assembly’s behavior, he was furious. Quickly, he pseudonymously authored To the Betrayed Inhabitants of the City and County of New-York. The next day, James Parker published it as a broadside. In To the Betrayed Inhabitants, McDougall launched a hostile attack on the DeLanceyite assemblymen and the colony’s acting governor, Cadwallader Colden. He alleged they were in cahoots, working together to obtain higher-ranking positions within the British Empire. They were not representing or working towards New Yorkers’ needs, McDougall claimed. They only represented and work towards their own. In early 1770, Alexander McDougall was arrested and imprisoned upon suspicion of authoring the broadside, gaining city- and continent-wide notoriety. He was, and would forever be, New York’s and the colonies’ very own John Wilkes. “[T]he Friends to Liberty and Trade,” intimately connected to the DeLancey assemblymen, were cautious of McDougall and his motives. They saw McDougall as challenging the broad-based legislative and popular support they had cultivated, carefully, since the Stamp Act crisis. McDougall’s rising political stock brought them closer together and, by extension, pushed them further away from anyone associated with him. McDougall’s supporters dined in a newly purchased venue, Hampden Hall, while he remained in prison. More importantly, though, the separate commemorations indicate that, from early 1770, New York City had two distinct, partisan, associational groups within it—“the Friends to Liberty and Trade” and Alexander McDougall and his supporters. Both characterized themselves as the “real” or “true” Sons of Liberty. Between mid-1770 and 1775, New York’s Sons of Liberty clashed on a regular basis. On each occasion, they reinforced partisanship within the city’s political architecture. By early 1775, after the First Continental Congress, the opposition between them was fierce. One partisan summarised the severity of the resentment. “[I]f this Province fights,” Frederick Rhinelander wrote, in January 1775, “it will be for the King.” Some four months before Israel Bissel came into New York City, Rhinelander, a “Friend to Liberty and Trade,” and his friends in that “political Club,” had already made their decision. They would be loyalists, in the event of war. But their loyalism did not have its origins in their opposition to the Continental Congress. On the contrary, “the Friends to Liberty and Trade” made clear their explicit opposition to the Intolerable Acts throughout 1774. Instead, their loyalism was grounded in partisanship, in pre-existing internal political conflict. The question of “who should rule at home?” was utmost in their thoughts. Indeed, “the Friends to Liberty and Trade” viewed siding with King George III as a means to “enlarge the Club.” Loyalism, as Rhinelander said, would make them “better enabled to counteract the Blues,” that is, Alexander McDougall and his supporters. When war did come to New York, most of “the Friends to Liberty and Trade” became loyalists. McDougall, as well as most of his supporters, became patriots, and many of them were among the hundreds who collected firearms in mid-April 1775. “New Yorkers that received firearms,” April 25, 1775, Muster Rolls Collection, New-York Historical Society (N-YHS); [McDougall’s account of Lexington and Concord], [April 23, 1775], Alexander McDougall Papers, Reel 1, N-YHS. For McDougall, see Roger J. Champagne, Alexander McDougall and the American Revolution in New York (Schenectady: Union College Press, 1975). New-York Journal; or, the General Advertiser, March 22, 1770. Other colonies’ support is in the New-York Journal throughout early 1770. 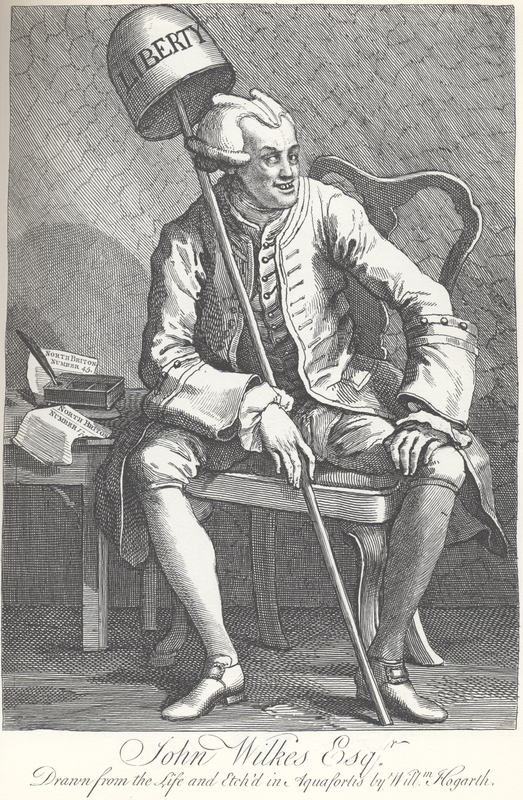 Wilkes was arrested, in 1763, for a seditious libel that criticized King George III and the Earl of Bute. It was published in the forty-fifth issue of The North Britain, which was a contrived reference to the Jacobite Rebellion of 1745. For a detailed analysis of Wilkite symbolism vis-à-vis McDougall, see Luke Feder, “The Sense of the City: Politics and Culture in Pre-Revolutionary New York City” (Ph.D. diss., Stony Brook University, 2010), ch. 4. Alexander McDougall and Isaac Sears to Samuel Adams, May 15, 1774, Samuel Adams Papers, 1635–1826, Transcripts, Vol. 2, 1771–1774, Reel 5, New York Public Library. [John Vardill], To the Worthy Inhabitants of New-York (New York, 1773); “Hampden,” [Alexander McDougall], The ALARM. Number I (New York: [John Holt?] 1773). The ALARM was also published in the New-York Journal; or, the General Advertiser, October 14, 1773. Historians often used this period to demonize the DeLanceys as self-interested demagogues. Many rely on first-hand accounts from the likes of William Smith, Jr.
 New-York Gazette; and the Weekly Mercury, February 5, 12, 19, 26, 1770, and March 5, 12, 1770. See also the New-York Journal; or, the General Advertiser, February 8, 15, 22, 1770, and March 1, 8, 15, 1770. Emphasis added. Frederick Rhinelander to John Vardill, January 5, 1775, in AO 13/105, [n.f.] The National Archives, Kew. For similar remarks outlining the coalescence of Alexander McDougall and his supporters into a political “set,” see William Laight to John Vardill, March 27, 1775, in Ibid. « Welcoming Two New Members to The Junto! This is really interesting Christopher, in part because of the differences between New York and my area of focus, the South. Of the colonial era political leadership, the overwhelming majority joined the patriots. There were a few exceptions, men who were part of the protest movements until 1775, and served on the revolutionary committees and in the congresses. What differentiated these individuals was not pre-war partisanship over who would rule at home – indeed they were usually close friends and business partners with the eventual patriots – but simply a concern about the lengths to which the patriots were willing to go, including independence, to achieve their objectives. To my mind, this speaks to the importance of regional studies of the origins, course, and consequences of the Revolution. My dissertation looks at the unique roles the committees and congresses played in the southern provinces based on strategic considerations specific to the South (namely the unique role the southern loyalists played in British strategy). Your dissertation also seems to be an important addition to the debate of whether the Revolution was a civil war. I borrow from political science definitions of civil war, that the conflict is more than just two groups from the same polity engaged in fighting. It also includes why they’re fighting, specifically “to take power at the center or in a region.” (Fearon) It sounds like that applies to New York, but perhaps counterintuitively it doesn’t apply to the South where the patriots controlled loyalists not because the loyalists were competing with them for political power, but because they were a necessary element of the British strategy to hold onto or take back political power. Thanks for the comment, Dan. I enjoyed reading it, and learning about your dissertation. I agree with you on the importance of regional studies. I am a big proponent of microhistorical approaches. And I am interested in your definition of “civil war.” I have issues framing the Revolution as a “civil war” because definitions are rarely used; most seem to turn it into a conflict between loyalists and patriots. As you know, it wasn’t like that–people changed sides. A lot! Thanks for the comment again, Dan, and I look forward to learning more about your research. Thank you for this great entry on McDougall, a figure who certainly deserves more attention. He not only played an important role in the coming of the Revolution, but is also significant to longer histories of partisanship and print culture in British New York. For this reason, he gets a mention in my book on Colden. I wonder if McDougall’s Scottish background deserves further commentary, especially given the rise of “Scotophobia” in England during the 1760s. Wilkes’ attacks on Prime Minister Bute are an obvious example of that phenomenon. Such anti-Scottish sentiment had clearly crossed the Atlantic by the time of the 1765 Stamp Act riots, when New Yorkers burned the effigy of another Scotsman, Lt. Gov. Colden, dressed as a Jacobite drummer. So it is quite remarkable that McDougall (who apparently possessed a heavy Highland accent) was able to utilize Wilkes’ “45” symbolism so effectively in 1770. I absolutely agree with your thoughts on, well, how odd it was that McDougall could mobilize such broad-based support, in New York and the colonies, in spite of his Scottishness. Indeed, I might actually downplay the significance of “Scotophobia” in New York, largely because it relies heavily on the links between center and periphery. In so doing, it slights the importance of local, or colonial, identities. And in a place like New York, the sense of community and like-mindedness between New Yorkers played an important role in shaping how they lived their lives. I’d be interested in your thoughts on it, though, and I’m looking forward to the book on Colden.